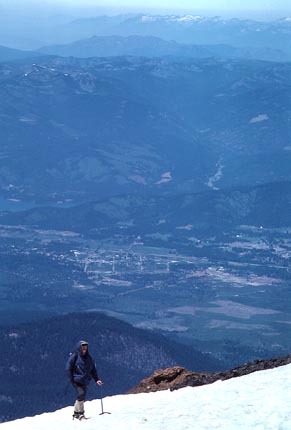 Several climbers joined me on this great weather weekend for our annual, one day, ascent of this fine peak. Leaving work early Friday, we all met at the old ski area parking after a fine meal, in Mt. Shasta City, for us. The expected start time is set for 5 a.m. The light in the sky is enough for seeing. This is rough on new people, who have never done anything like this. This is not the activity for a late start, and we don't stand around gabbing and visiting. The air temperatures are close to freezing, but we all know we'll get warm quickly from the exertion. Rocky roads led up past the old lift towers, then it's cross-country and good-bye, almost, to green growing things. The ridge separating the ski bowl and the standard route up Avalanche Gulch requires some guiding finesse to hit it just right. If crossed correctly, climbers will have minimal drop into the main gulch to continue up to Lake Helen. The climbing conditions today were dirty and rough frozen snow/ice. We had to crampon up and cross a highly uneven surface for thousands of feet. Some climbers turned back as we reached the Lake Helen campsite. I didn't have an assistant to guide them faultlessly back. They were allowed along, and released from the trip on the condition that we are no longer responsible for them if they turn back. The climb up the snow was nothing much that I remember differently. One climber considered the group too slow, and must have chosen to set a personal record for himself. He later reported summitting in under seven hours. I was game to go with him, but I was leading this group. We would repeatedly plod up, then stop to wait for the others. Some of the faster ones were annoyed, but as a Sierra Club group leader, I am obliged to keep us all together. We finally reached the Red Banks, where we took a long rest. I tried to encourage a slow climber to keep going. This is not run as a death march, and I pride myself on getting people to the top. Being my fourth ascent, I had no particular need to summit, except to lead this group. I kept everybody coming. There were many other climbers coming up, with one asking how to use an ice axe. The snow was too dirty and rock-laden to demonstrate a self-arrest. Well, I got summit fever, and took what climbers I could with me to the top. It was a beautiful day. Windless and warm, we dallied about the top. I read the register. Finally, the last climber, of our now group of six, came up after about ten hours of climbing. I had delayed the start-back time so this climber could make the summit. 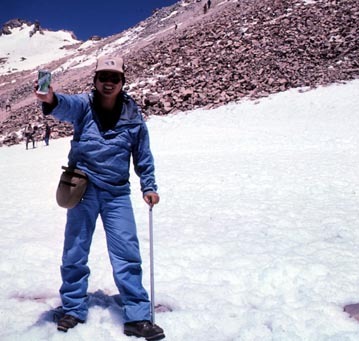 We had posed for our summit photos, and I hardly remember a better day for this, except for the snow. I visited the summit area hot springs. In the photo, I am holding a can of "Shasta" brand soda. An appropriate drink for the occasion! Getting down was quick. I brought along slick, cheap, nylon rain pants and used my pile jacket as insulation. I began glissading almost from the summit plateau at about 13,800 feet. Everyone else had to mostly walk at the less steep spots. I came to the Red Banks, where I spied a person waiting with a camera at the bottom of a snow gully. I obliged him with a photo op of me splashing out of the gully, with snow flying up with me. I wonder if he took the picture. The others went more around the gully, and as we got together, I continued my glissade down the Heart. A good snow "trench," which most used for sliding down, was clear of most of the rocks and dirt. I slid almost to the point where we had to re-cross the ridge back to the old ski area. Never were so many thousands of feet such an effortless descent for me! We had plenty of daylight, and I had never felt so great after a climb like this! Back to the cars, we shook hands and motored our own ways. Back in Mt. Shasta City, I took a last picture of the mountain. We certainly returned home well that night. I was to never do this again, to date. The local chapter would never run a trip like this, almost ever again. While I have invited people to fly up and join me for a weekend, no one has taken me up on the offer. The yearly ritual, for me, is to climb a hard peak to fortify my libido, and boost my confidence that I still can do this. I believe the intent was the same for the leader that preceded me. He was a marathon runner who ran each year. An older person, he too gave up on these leads. For awhile, a locally famous, 70 year plus, individual scheduled leads, but I never went with him. He made a news article, but stopped it, too. I have come to accept, as in most everyone's life, there is a point when you're just too old.